AGILENT Technologies has announced that it has begun customer shipments of the industry's fastest real-time oscilloscope and highest bandwidth active probing system. The Agilent Infiniium 80000 series 10, 12 and 13GHz oscilloscopes are the only real-time oscilloscopes to offer more than 8GHz bandwidth, a 40GSa/s sample rate, and full bandwidth performance to the high-impedance probe tip. This real-time measurement system delivers performance, accuracy and probing connectivity for validating high-speed serial buses. This year, proprietary high-speed serial buses and serial bus standards such as Fibre Channel, fully buffered DIMM (FBD), serial ATA (SATA), serial attached SCSI (SAS) and PCI Express will have performance points that reach into the 4 to 8Gb/s range along with edge speeds that have rise-times faster than 50ps (20 to 80 percent). Agilent's new 10, 12 and 13GHz, 40GSa/s high-performance oscilloscopes and associated probing systems capture the frequency harmonics, and make accurate and repeatable measurements on such high-speed signals. Earlier oscilloscopes had maximum real-time analogue bandwidths of 7 to 8GHz, which designers found limiting. With more than a 50-percent performance improvement over previous products, the DSO81304A has 13GHz real-time bandwidth. Engineers can now have an oscilloscope that provides higher signal fidelity, more accurate and repeatable measurements and improved test margins for high-speed designs. Previously hidden, high-speed signal anomalies are now visible using this benchmark-setting test tool. 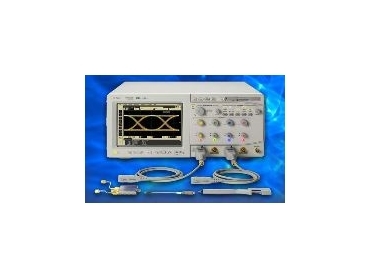 With software packages to match the oscilloscope to specific measurement needs, Agilent's Infiniium DSO80000 Series includes second-generation jitter analysis, serial data analysis with 8b/10b decoding and a growing list of compliance test packages for standards such as PCI Express, Ethernet, DVI, HDMI, Fibre Channel, FBD and SATA. For designers with specific test requirements, these software packages facilitate rapid problem identification and resolution. Using the My Infiniium software package, engineers can open custom programs from Infiniium's front panel, create menu items that launch programs, and move analysis programs from a PC to the Infiniium.